The Voice of the Martyrs invites you to become our “friend” on the social networking site www.myspace.com. Our page is located at www.myspace.com/voiceofthemartyrs. To add us, simply follow the link and click “add to friends.” If you don’t already have a myspace page and you would like to create one, click here. On the VOM myspace, you’ll find pictures, video clips, banner and more. Check back often for new content. Myspace.com was founded in August of 2003 by the internet company eUniverse. Currently, it is the third most popular website in the United States and the sixth most popular website in the world. The Voice of the Martyrs looks forward to sharing the stories of persecuted Christians in this unique and expansive way. Have you ever called tech support and unexpectedly talked to someone with an Indian accent? In the last couple of years, India has been emerging as a technology center. At VOM, we know that technologic growth isn’t the only story coming out of India today. There is also a strong nationalist/religious movement going on there as well. Supporters of this movement believe that to be Indian is also to be Hindu. Indian Christians, especially those who are willing to share their faith with others, are threatening to these groups because they don’t share their thinking. Many of those tech support call centers are located in the bustling, modern city of Bangalore. Paul and Prasanna live and work on its outskirts, purposely choosing to live among the poor so they can reach out to them. Paul is a full-time evangelist, while Prasanna is studying toward her law degree. They have a small Bible study in their neighborhood. They didn’t think much of it at the time, but carried on singing and praying together. Little did they know those words would soon become very real to them . At 6 p.m., a mob of members of a Hindu nationalist group burst through their door and began to strike them. Paul was afraid his wife might be violated, so he grabbed her hand and held on as tightly as he could. He envisioned angels protecting them. He also said to his wife, “If we die, let us die in ministry.” Eventually, their attackers dragged them to the police station and accused them of forcibly converting Hindus. When it was all over and the couple returned home, they found that all their belongings were destroyed or stolen. Very frightened, they sought refuge in the homes of other believers, but no one was brave enough to take them in. When we heard about their story, we met with them and spent some time encouraging them. After several months of struggling through what happened to them, they now view their ordeal as a victory. They have lived the words of Hebrews 10. Paul and Prasanna stood their ground in the face of suffering, humiliated and beaten. Prasanna now wants to use her law degree to help other Christians who are jailed or falsely accused of crimes. With help from VOM, they moved to another area of the city, which is also a tough place for evangelism. They are fully committed to sharing the good news of Christ. They realize the darkness of Hinduism can never overcome the bright, shining light that Jesus offers. Recently, I have come across numerous stories detailing increased persecution of Christians in some countries in Africa. In northern Nigeria, there have been several reports of Muslims attacking Christians and attempts to have them recant their faith. 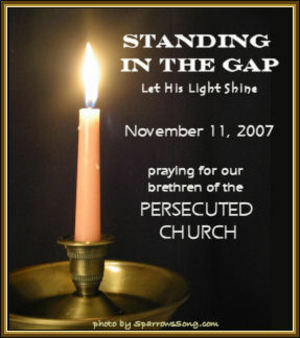 In these cases, I have seen believers choosing to remain faithful in the midst of great persecution. Some Christians have lost their homes, jobs and sometimes their lives because they choose to stand for Jesus Christ and refuse to yield to the pressure exerted on them by Muslims. I came across an amazing example of this same courage in the book, Jesus Freaks, Stories of Those Who Stood for Jesus: The Ultimate Jesus Freaks, compiled by dc Talk and The Voice of the Martyrs. As you read about the dedication and faithfulness of the believer in this story, pray for our brothers and sisters around the world who face many different challenges, as they serve Jesus Christ. The following story is from the Associated Press. BAGHDAD (AP) — Iraq's prime minister pledged Saturday to protect and support the Christian minority that has been fleeing the chaos and sectarian violence in the country. After receiving the Chaldean patriarch of Baghdad, Emmanuel III Delly, Nouri al-Maliki affirmed his government's readiness and determination to defend the small community and to stop the outflow of Iraqi Christians, according to a statement released by al-Maliki's office. Delly, who is the head of Chaldean Church in Iraq and spiritual leader to all Chaldeans, has been outspoken about the need to protect minority Christians from Iraq's spiraling violence. Kidapawan City (Republic of Philippines), SVM News, October 27, 2007: Pastor of Jesus Is Lord Ministries was stabbed to death on October 26 in Barangay Perez of Kidapawan City in North Cotabato province in southern Philippians. Pastor Martin Ambong (48) was brutally murdered on Friday early morning near his church with16 stab wounds on his body. His face was also flogged by a hard object. "Pastor Martin was murdered probably on Thursday after midnight", police said to the Salem Voice Ministries (SVM) News Service. "Villagers have seen his body first lying near the church on Friday morning", police added. When the pastor murdered, his family was at their house in Barangay Poblacion. Pastor was staying at mission house. Mostly he used to spend his time over there. "Pastor Martin Ambong has no known enemies. Such a good and humble man he was", villagers said to the SVM News. Saratu Turundu was thiry-five and unmarried. She loved kids so much and desperately wanted her own, but God had not answered her prayer. Saratu chose to devote herself to God and the church. She embraced her church family with her whole heart and especially loved teaching Sunday school. Her interaction with the kids and her opportunity to show them the way to Christ fulfilled Saratu with incredible joy. She knew she could never be happy without Christ. But the fanatical Muslims who dominated her town of Kaduna, Nigeria, started persecuting Christians. She had heard stories of Christians being persecuted in other villages, their homes and possessions burned. Some were even beaten and killed. So when mobs came to attack the Christians in Kaduna, Saratu had already decided to stay and take a stand for Christ. Saratu’s brothers begged her to flee into the woods with them. But even as she watched the angry mob burn her beloved church to the ground, she wouldn’t go. She knelt and prayed on the floor of her apartment as Muslims doused the building with gasoline and set it on fire. She is remembered by her family and friends as a kind, compassionate person who showed love to everyone. She died loving her Savior. Tales of super-human strength are as inspiring as they are incredible. We are awed by stories of mothers lifting burning cars off their children in terrible accidents. Driven by adrenaline, the human body is capable of amazing feats. In the same way that adrenaline affects the human muscles, our faith can enable our spiritual muscles to accomplish what we never thought possible. Saratu flexed her spiritual muscles when she decided to take a stand for Christ in her community. She likely never realized she had the strength to do so before that moment. Yet God enabled her to do it. Have you ever done something you thought you could never do? Thank God today for his faithfulness to make you stand strong. A few days ago I challenged you to blog about the International Day of Prayer for the Persecuted Church that will be held this year on November 11th. As a result, I have been contacted by a few people who are so committed to the persecuted church that they made a special banner that all of us can use. And I would like to thank Nanna's Reflections for sharing this with me, and Sparrow's Song for designing a beautiful banner so that we can remember and pray for the persecuted church and promote the International Day of Prayer. There are two sizes of the banner you see below. All you have to do is click here and then you will see two banners and their html code that you just need to cut and paste into your blog. Thank you again for all participating! I’ve been thinking about the words of Hebrews 10:34 in recent days, which say, “[you]…joyfully accepted the confiscation of your property, because you knew that you yourselves had better and lasting possessions.” The rest of the passage is about standing side by side with those suffering persecution. The idea of losing possessions became more real to me when I thought of the 1,800 people who lost homes in the fires in Southern California this week. They lost everything they had, melted in the raging hot fires. If I had just lost my home, my natural inclination would not be to joyfully accept the loss knowing my real treasure is in heaven. My things have value to me. They make my life more comfortable; they make my home look a certain way; they represent a pleasant memory. It’s hard to put my focus where it belongs: on the lasting possession of a place in eternity with the King of the Universe. Christians who are persecuted often lose their homes or possessions, whether it is the government who confiscates property or a group of neighbors who force them out of the village. So many of them I read about are able to joyfully accept their loss, because they look forward to an eternal treasure. As I stand with my brothers and sisters, may my own attitude be one of joy, no matter what the circumstances. See, a few days prior I purchased two of these cool new VOM t-shirts because they ALWAYS open up conversation about my faith. And sure enough, that day, my cashier noted the front of the shirt. She asked me why that shirt was illegal, and so I told her that it was because of the content on the back of the shirt. Well, as you can imagine that got her curious, as it did the others in line behind me. So I turned around, lifted up my long hair, and SHE read the back outloud so that everyone around us could hear. I LOVE IT when pre-Christians (yes, I just made that up) read the bible out loud in public. And honestly, there I was giggling inside because the shirt totally served it's purpose (well beyond covering my body). After this dear lady read the back she told me that she had no idea that Christians were persecuted all over the place. I told her it was true and that here in America we are very blessed because for now we have religious freedom. So here's another challenge for you. Why not buy a few VOM t-shirts and wear them. 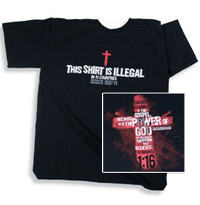 Not only are they nice shirts, good quality and have fun designs, they really DO open up conversations about our faith and our suffering brothers and sisters. Click here to visit the VOM bookstore.